Adding custom pools in Scottsdale? Nothing is better than a nice refreshing pool on a hot summer day. And if you invest in a swimming pool, you can enjoy the hot Arizona summers instead of dread them. Desert Environments is here to help. 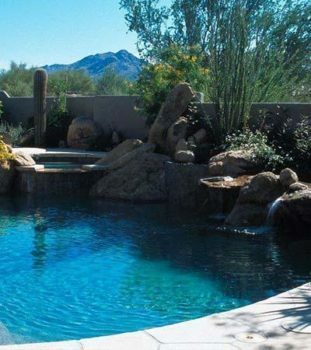 We're experts in custom pools in Scottsdale and will assist in finding the right one for you. Specializing in a variety of different pool types, we'll help you select the perfect one to compliment your landscape. Adding a custom pool to your landscape not only gives you a great place to swim and relax, but they also help cool the surrounding area which is essential for Arizona's hot desert climate. This will lower the temperature of the nearby area significantly, working as a built-in natural air conditioner! A swimming pool combined with another water feature like a waterfall or fountain can work together to keep you cool and look great while doing so! Need something to compliment your new pool? We can add other landscape features too such as outdoor fireplaces and kitchens, barbecues, and more! Not having a pool makes selling a home in Scottsdale difficult, as they are almost a given in properties in the area. Because of this, adding a pool can greatly increase the value of any home in the area. Integrating the look and design of your pool with the design of your landscaping not only gives you a eye-popping appeal for if and when you want to sell, but it also creates an outdoor oasis where you can relax and cool off without having to leave home. And with outdoor lighting, you can enjoy it after dark too! With over 25 years of experience, the team here at Desert Environments can give you a professionally-built pool. Our custom pools in Scottsdale come with industry standard warranties and are designed and installed using the highest quality standards. We can design and build just about any size and shape of pool you can imagine. We guarantee our work, for your peace of mind! Call or contact us today to get started.